Yesterday was the first day. 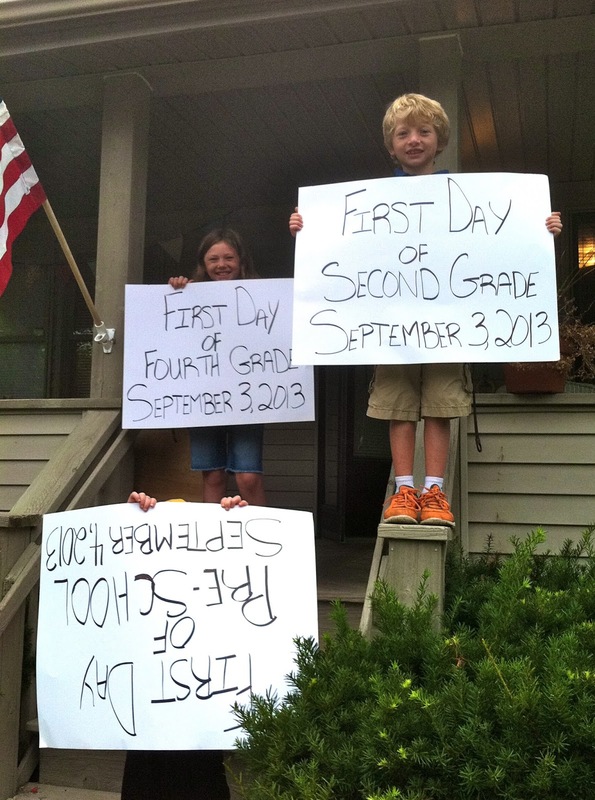 Yesterday, three of my four kids, along with seemingly every kid of every friend I have on Facebook, started school. First day of school and we're all standing on the porch railing, sign upside down, not knowing middle school had a full day, so nervous none of us could eat breakfast...but it's here & it's mostly all good. We've been doing first days of school around here for a quite a few years. I'm almost an old pro at it, or something like that. I mean I should be. But yesterday was the first day of middle school for my oldest and the first day at a brand new school for my other two kids. It was new new stuff. 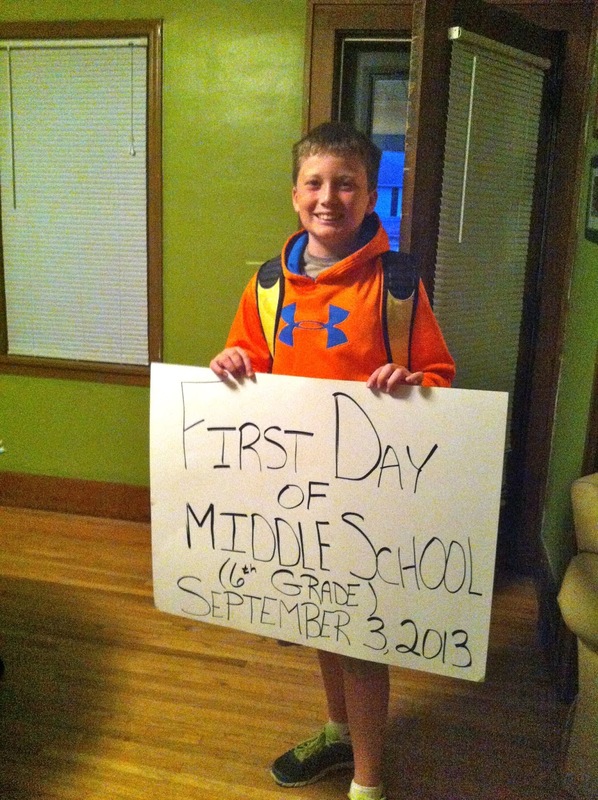 And did all of you realize that middle school starts really, really early? Like stupid early. The bus picks Peyton up at 6:45 a.m. He has been setting his alarm for 6 a.m. for the past two weeks in preparation. Last week, I proudly congratulated him as I rolled out of bed groggily around 8 a.m. Never realizing that I would need/want to get up with him when he actually started school. Yesterday, I got out of bed, turned on the light (because it was that early people) and walked into the kitchen to find Peyton already dressed and ready to go. It was 6:15 a.m. I made him do all the first day of school stuff I've made him do since Pre-K...pictures with the sign, pictures with the pencil cake, etc. He was really into it. As I watched him walk to his bus stop, I was so glad I got up to be with him on this new first day of school. Because it's a big deal, it's middle school and it's my boy and it's sad/happy/exciting/nerve-wracking/weird/wonderful. By the time the other kids were up, it felt like it was lunch time. It was 7:30 a.m. I was awake and a bit jittery from too much coffee. "Give me a B! Give me an A!," I shouted in the hallway between the kids bedrooms, getting my "B-A-C-K T-O S-C-H-O-O-L" cheer on. "Give me a break," replied Lucy acting like she was heading to freshman year rather than the fourth grade. I didn't let the eye rolls and the groggy grumpiness get me down. I pulled up one of my favorite back-to-school jams on YouTube-- "Back To School Again" from Grease 2--and danced just like Michelle Pfieffer as the kids came into the kitchen for breakfast. We danced and laughed away the nerves. I had more coffee. And we did all the first day of school stuff we always do...pictures with the signs, pictures with the pencil cake, etc. I waved as their bus pulled away. I said a little prayer hoping they had a good morning in their new school. Because it's a big deal, it's new everything and it's my kids and it's a little scary/happy/exciting/nerve-wracking. Wade and I walked back home to have some pencil cake. I felt proud that we made it through the first phase of the newness. I actually felt really exhausted. We might have had a good start, but damn, it's just the beginning of a lot of early mornings. Most importantly, can we talk about cake? I think there should be cake at every celebration, every new new thing, every anniversary or even just on a really bad day. Cake is always a good idea. We have special cakes for Christmas (a tree), Easter (a bunny) and of course the first day of school (a pencil). 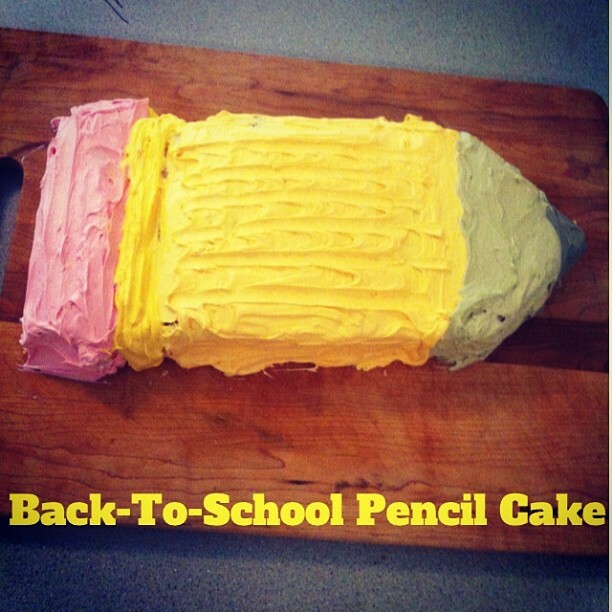 So for this week's Pinterest Poser** Challenge, I'm showing off my Back-To-School Pencil Cake. 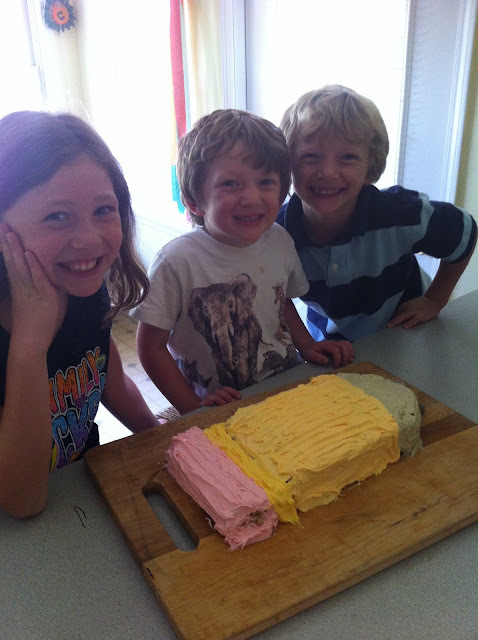 I started making this cake when my oldest went to Pre-K. Waaaay before Pinterest. 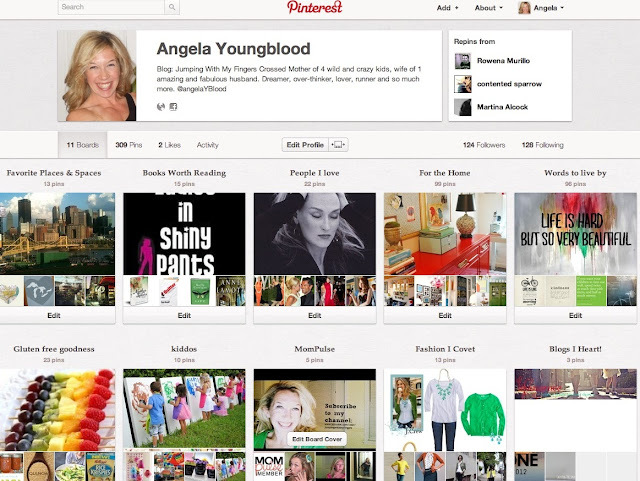 It was back in the days of cutting out recipes from magazines and stuffing them into a giant folder. But I thought I'd share it, just to show you I'm the ultimate un-poser. This recipe is simple. The magazine I got this idea from a million years ago used brownies, but we are cake people, so we use cake. We make this with Betty Crocker Gluten Free Cake Mix and we use two boxes because if you know gluten free, you know one cake mix usually makes for a very thin cake. 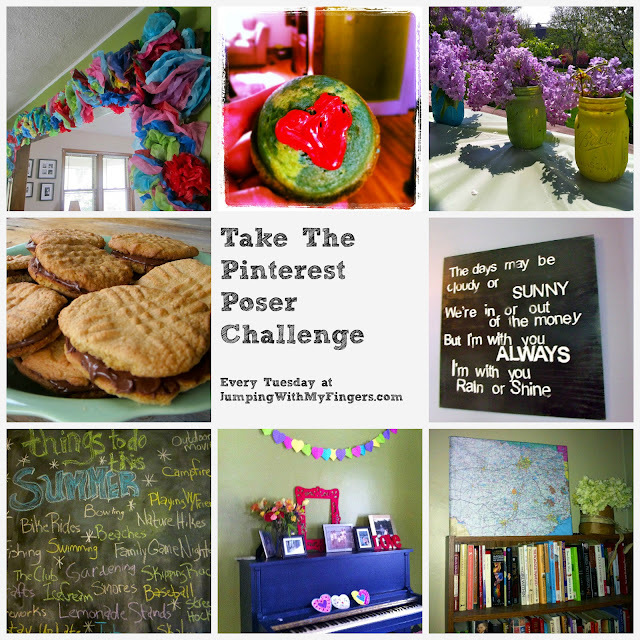 This year, we used yellow, but you can use chocolate or whatever flavor you want. Bake the cake (in a long rectangle pan (you can tell I'm not a professional baker or even close, because I don't even know pan sizes, but you know right?)) per box directions. After the cake has cooled, cut along the sides to make the cake thinner and more pencil like. Use the extra cake for the eraser. Cut the tip of the pencil into a triangle to make it more pencil like. Use the extra cake for a mid-baking snack. Then start mixing your frosting colors. I used Betty Crocker Whipped White Frosting and McCormick food coloring. Some years my yellow is more yellow. Other years my pencil lead is more blue than pencil lead color. But, no worries, just have fun with it. Eat it before the first day of school for breakfast if you want. 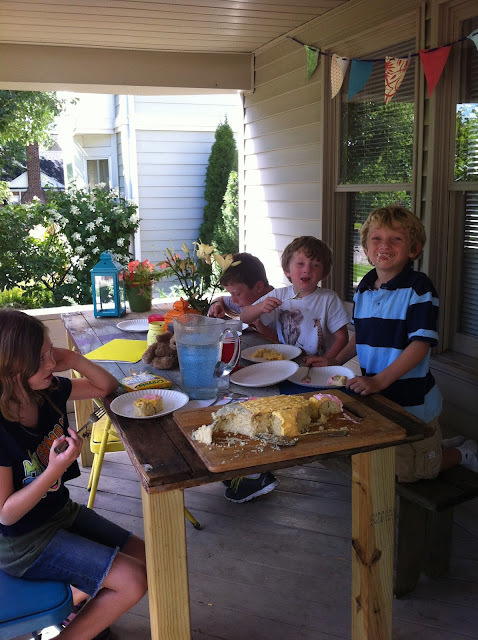 We usually make a big deal when they come home (dancing and singing are usually involved) and eat the cake. Do what YOU want. 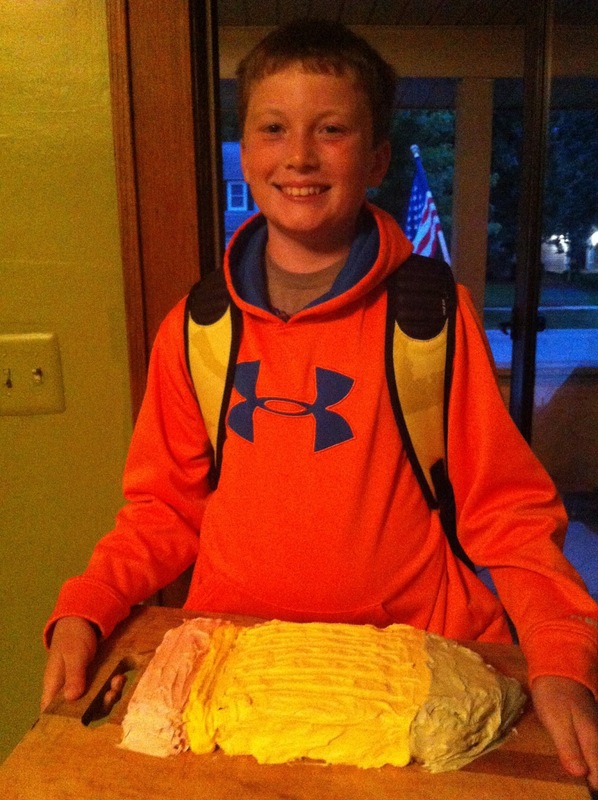 This Back-To-School Pencil Cake could even be made as a Good Luck On Your Test Cake or You Are Half Way Through Your School Year Cake. You have the best traditions! Love the pencil cake. Very cool.